The phased rollout for Red Dead Online is over: everybody who owns a copy of Red Dead Redemption 2 is now welcome to saddle up and ride into the online multiplayer frontier, regardless of which edition you bought or when you first played. Developer Rockstar Games made the announcement on its official Twitter today, though the servers had already been open for a few hours before that (I know because I logged in and played for a bit myself). Remember the rolling garbage fire of downtime, lag, and connection dropouts that was GTA Online for the first few weeks after it went online in October 2013? Despite technically being a beta - it doesn't even let you make microtransactions yet - Red Dead Online isn't like that at all! It's holding stable despite concerns that the whole thing would fall apart after the floodgates opened. We'll see how it holds up over the weekend when word spreads and more people have time to play, but so far, so good. Before you log on, there are a few things you should keep in mind. 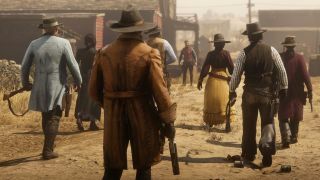 First, despite Red Dead Online being included free with Red Dead Redemption 2 you'll still need an online subscription for your platform of choice to participate (check out our roundup of deals on PlayStation Plus codes and Xbox Live Gold 12 month subscriptions to save some cash). Second, you'll need to play through a fairly lengthy tutorial before you can posse up with your friends in Free Roam - expect to spend an hour at least. And third, we have a whole bunch of Red Dead Online tips so you can get the most out of your playtime. While you're out there, why not play along with our quest to reach Rank 50 of Red Dead Online in 10 weeks?